The crown jewell of the Capped Bust series. 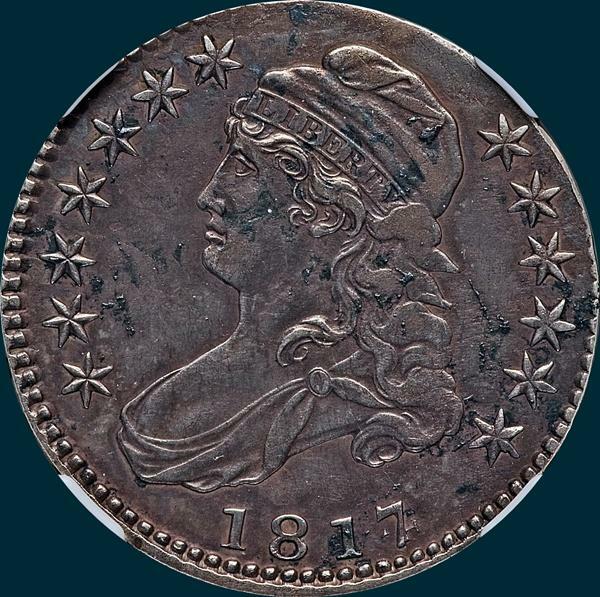 This marriage dominates the top grossing Capped Bust Half Dollar sales. For most, the only way to aquire one is to find one. For many this is the show stopper when it comes to completing a set, even for those with the financial means to afford one. 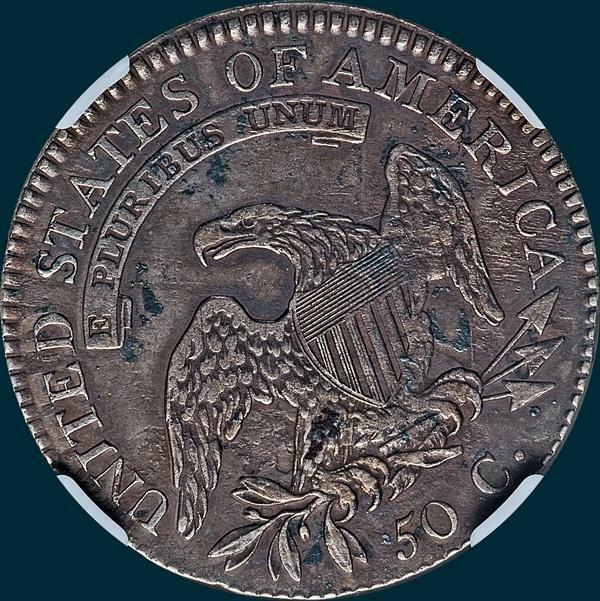 Variety Attribution O-102: Obverse- 1817 over 14. Scalloped point toward milling. Stars sharp. Date is 9 1/2 mm. and evenly spaced, with the original 4 shwing clearly. The lower left point is distinct in front of the stand of 7. The upper point of 4 above crossbar of 7. The lower right stand and crossbar of 4 show to right of the 7. O-102a: There is a die crack spanning the entire obverse, from edge above upper peak of cap and running downward across cap, lobe of ear, lower curl and just right of 7 to edge. Reverse- 50 C. is 1 3/4 mm. Arrow to A is 1/2 mm. The most unusual feature of this reverse is the I's in UNITED and AMERICA have the lower right serifs missing, thus causing them to look like J's. All lettering and devices sharp. 2. The Elton Dosier coin, discovered in 1976, sold by Sheridan Downey in 1998, 2001, 2004, and sold again in October of 2015 by Charles Link. PCGS F-15. 3. The 2014 ANA sale coin. Tooled around the date. PCGS VF Details, Tooled. 4. The Colorado coin. Discovered in Colorado in 2007, sold in the 2008 ANA sale. Scratched on obverse. PCGS Good-6. 5. The Overton-Parsley coin. Discovered about 1963, sold as part of the Overton Collection in 1993. Repaired impact mark on reverse, details of Good. 1. The Eliasberg coin. The discovery piece for the variety, extensively pedigreed. PCGS AU-50. 2. The George Williams coin. Found in fill dirt in upstate New York. NGC XF Details, Environmental Damage. 3. The Floyd Farley coin. Discovered ca. 1967, sold by Sheridan Downey in 2002. NGC VF-25. 4. The Al Burke coin. Purchased in 1965, correctly attributed about 1973, displayed at coin club meetings by the avuncular Burke, a Philadelphia schoolteacher, for years thereafter. Sold to Don Parsley by Sheridan Downey in 1997, sold by Downey again in 2005. PCGS VF-20. 5. The Stewart Witham coin. Sold at auction by Heritage in August 2010. PCGS VF-20. 6. The Louisiana coin. Announced in the numismatic press in July 2012. PCGS VG-8.